ULTRA Music Festival has pulled out all the stops for its nineteenth edition – significantly upgrading the VIP ticket experience with 4 major additions. Enjoy food from our exclusive chefs and drinks from our handpicked mixologists on the brand new Biscayne Barge! This large VIP-only lounge area is situated in Biscayne Bay with beautiful ocean views— perfect for taking a relaxing break from the action. For your maximum convenience, VIP ticket holders will now have a completely separate entrance on the south side of the festival. You will stroll down the magnificent, brand new Ultra BayBridge and right into the festival in just seconds. 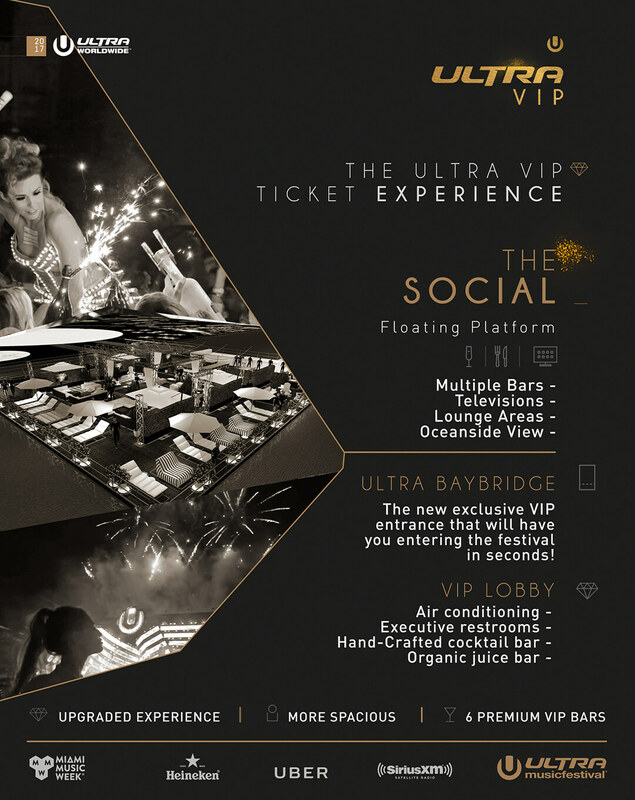 This year we are introducing the VIP Lobby, a hub of VIP-only amenities including air-conditioned executive restrooms, handcrafted cocktail bars, an organic juice bar, and various lounging areas for your comfort. We have effectively doubled the amount of space available to our VIP ticket holders. Our premium viewing platforms, in particular, have been changed to provide more space for you, ensuring breathtaking views of the Main Stage, MegaStructure, and Live Stage. Grab your VIP tickets before its too late!